Das Schnitzel Haus may bill itself as a German restaurant, but they certainly don’t have a German speaker making their menu. Spelling errors abound on both the menu and the website (they even misspelled the restaurant’s name on the Menu page – twice!). It’s almost comical how atrocious it is. But the food is good, so I am not going to get too upset about the spelling. I will use the spelling on their menu in this post, but will add the proper name in parentheses just in case you are familiar with the dishes or want to do a little research. Don’t rely on the drop-down menus on the website. They are minimalist at best. Be sure to download the complete PDF to see everything they offer. 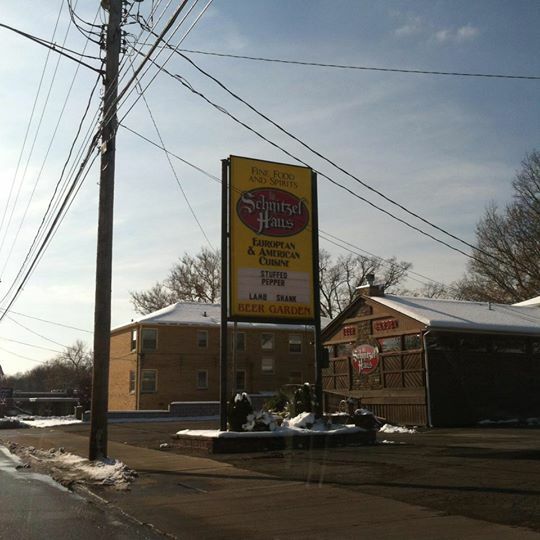 Das Schnitzel Haus was opened by the Djurin family, long-time residents of Parma, Ohio. The fact that the restaurant has cevapi (aka ćevapčići), which is a kind of minced meat kebab, on the menu led me to believe the family’s origins may be the Balkans, and in fact the woman I spoke with there one night said she was Serbian. The restaurant and outdoor, heated Beer Garden (Biergarten) on Pearl Road offers customers reasonably priced German food and drinks, combined with friendly service in a cozy, warm atmosphere. The restaurant is open 7 days a week. The food here is much better than Der Braumeister. There are some hit or misses, but generally the food is a hit. The bread and butter service was really good. 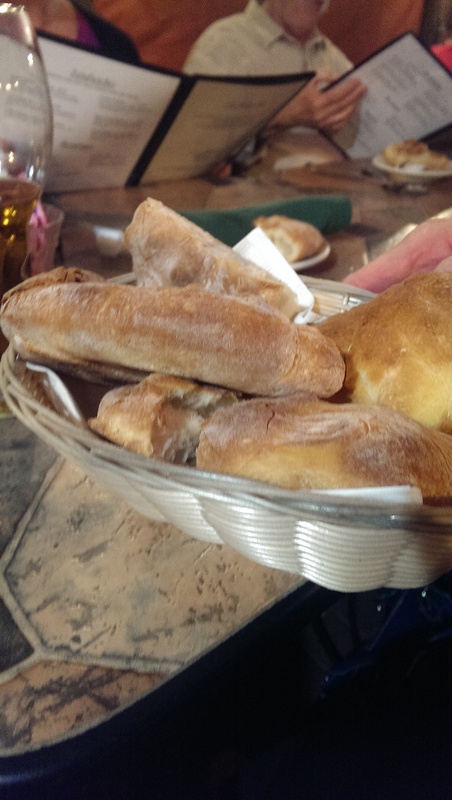 The bread was warm and crusty, and the butter was nice and soft. Pierogis are not a German dish, but they are probably included for the Cleveland palate. For that matter, Sauerkraut balls are a Cleveland invention as well. 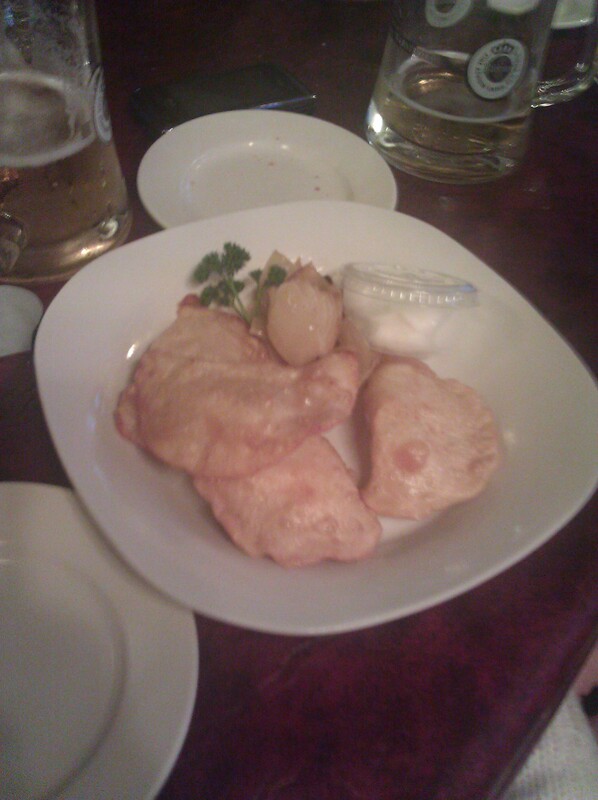 These particular pierogi are deep-fried instead of boiled. They are served with sour cream and grilled onions. 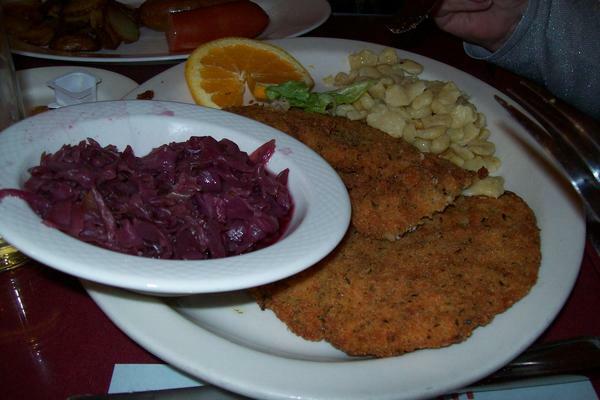 The schnitzels are fried well, and the sides are quite tasty. A Schnitzel is a house butchered & trimmed cutlet (usually veal, but also pork), thinly pounded, seasoned, lightly breaded and fried or sauteed. This photo shows your basic Schnitzel. If I had to hazard a guess I would say this one is the veal “Wiener Schnitzel vom kalb” (Wienerschnitzel vom Kalb). The sides are red cabbage and Spätzle. Both are quite tasty. On my first visit I enjoyed the Käse Schnitzel, which is a chicken breast pounded thin and battered in egg, sauteed in a pan, and topped with melted cheese. It is served with a lemon slice. 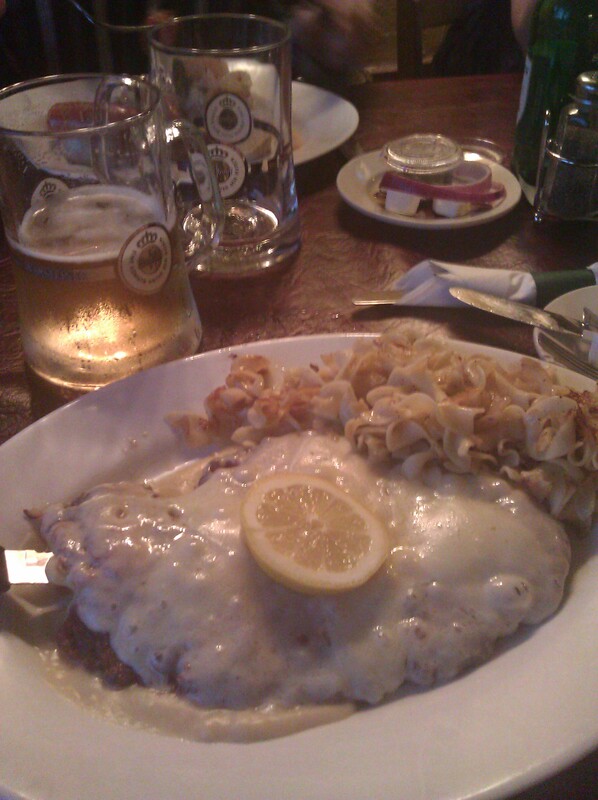 I found this Schnitzel to be light and flavorful, and I really liked all the cheese. That said, this isn’t exactly authentic. I ordered it with a side of cabbage and noodles and a dinner salad. On my second visit I ordered my go-to favorite, the Jäger Schnitzel (Jägerschnitzel). A Jägerschnitzel is literally translated as the Hunter’s Schnitzel. 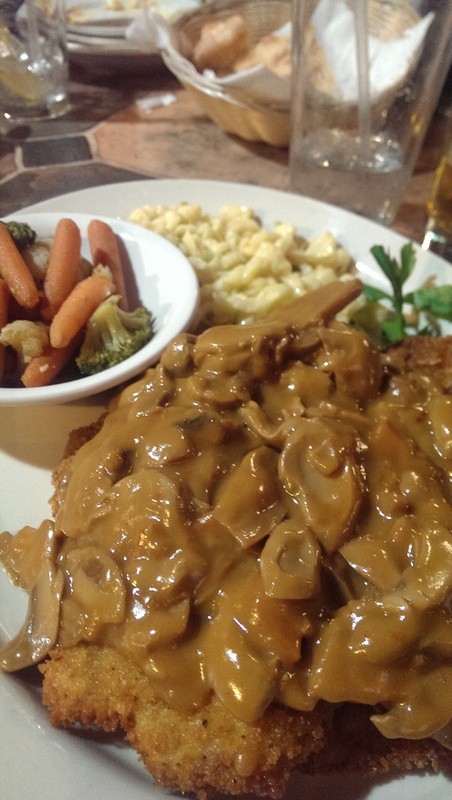 It is a pork schnitzel and is topped with a delicious brown mushroom gravy. This is one dish that Der Braumeister does not do well at all. Das Schnitzel Haus does a good job, and the gravy is flavorful. I substituted vegetables for one of the sides. The veggies looked extremely unappetizing and overcooked, but they were in fact quite delicious. Don’t let the appearance fool you. 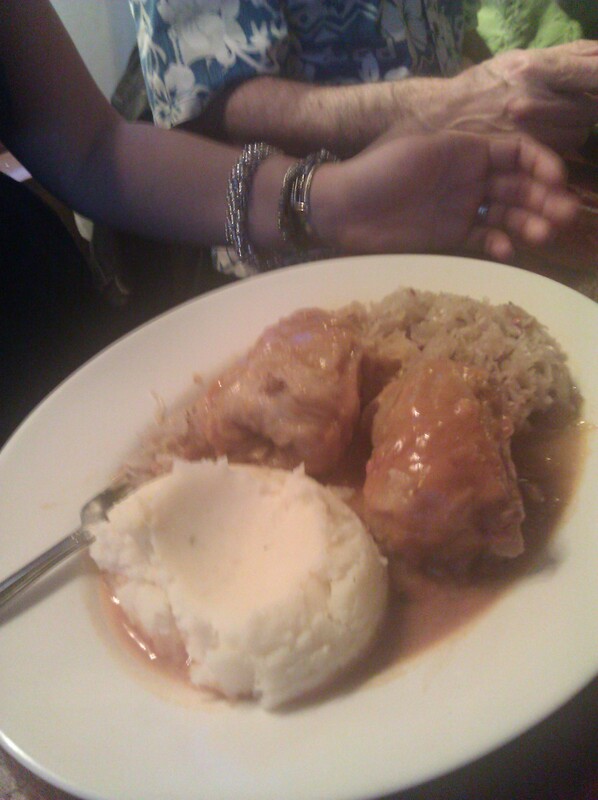 One of my fellow diners enjoyed the Chicken Paprikasch. 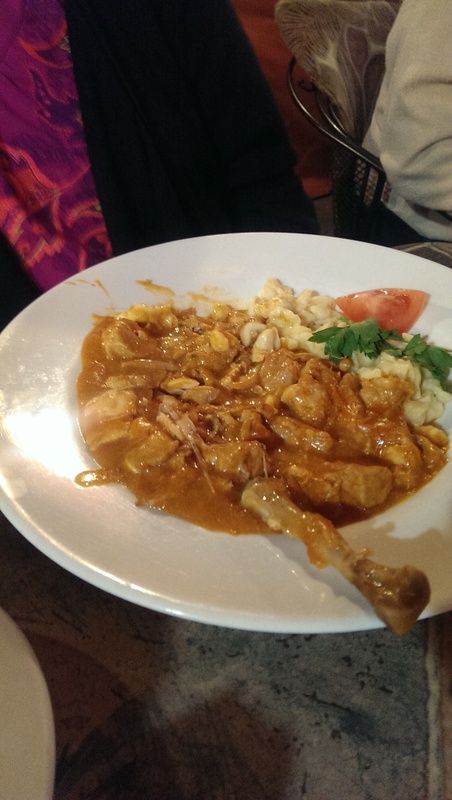 It is made with white and dark meat cooked in paprika sauce thickened with sour cream served over spätzle. The Hungarian Goulash is also a successful version of Goulasch. This Goulasch does not have sour cream in it, which indicates that it is definitely Austrian in origin. Austria was part of the Austrohungarian Empire, and this is the version of Goulasch that I am used to from my years in Austria. The sauce is very flavorful and the beef was tender. The Goulash is served over Spätzle and comes with a dinner salad. If you are looking for a unique dish that most people don’t think of I recommend ordering the Kassler Fleisch (Kasseler). 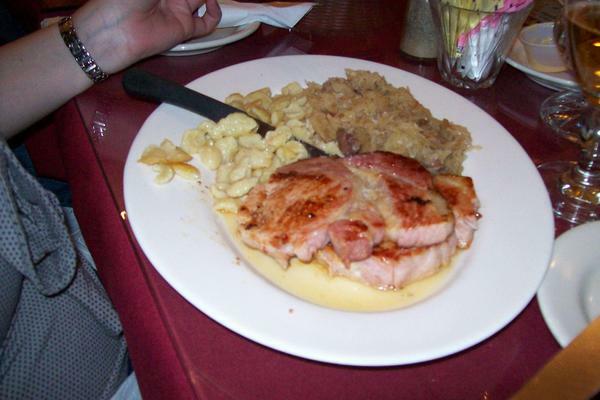 They are grilled, smoked pork chops served with crisp potato pancakes and cooked sauerkraut. This smoky dish is a definite favorite of mine. The terribly named Kraut Wickeln (Kohlroulade or Stuffed Cabbage) features two boiled cabbage leaves stuffed with beef, pork, smoked bacon, and rice all cooked in paprika and garlic gravy. Served with kraut and a side of your choice. If you are a fan of stuffed cabbage you might want to give this a try – although if you prefer the taste of tomato with your stuffed cabbage this is not the choice for you. One fellow diner absolutely raved about the Walleye here. He said it is the best in Cleveland – and that’s saying something. It is baked in a garlic white wine sauce and comes with a baked potato and green beans. Good luck trying to save room for dessert (or as they call it “Desert”). 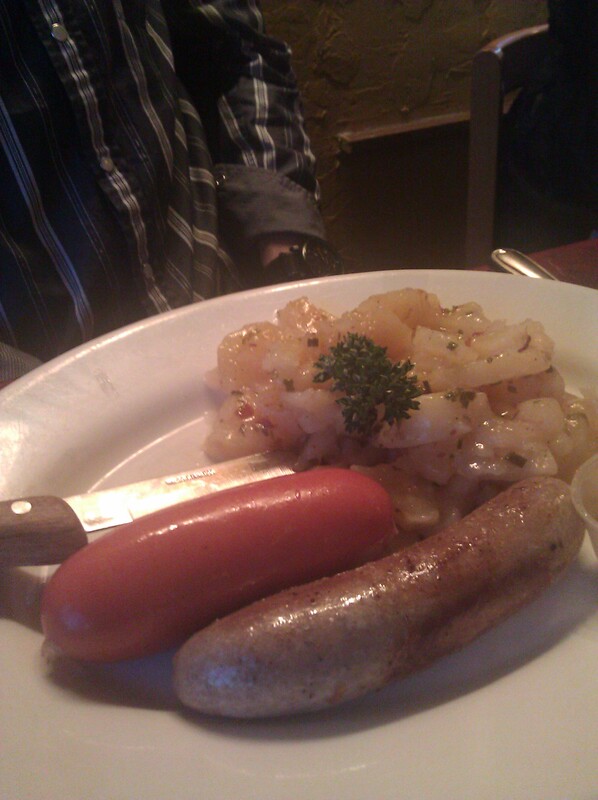 German food is very hearty. I doubt you will have room.